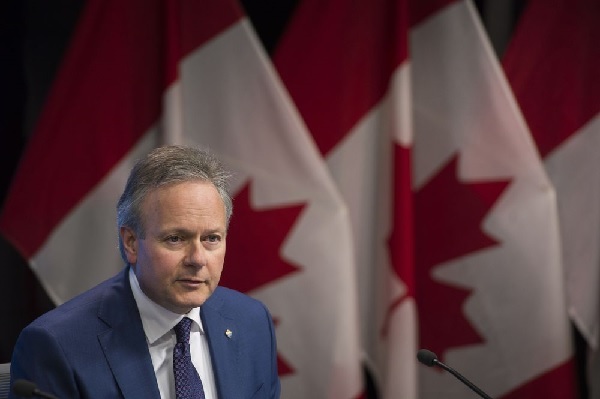 Canada has joined the U.S. in the inverted yield curve club, signaling a growing risk of recession that may keep Stephen Poloz on hold for his final 14 months as head of Canada’s central bank. The yield on Canada’s 10-year bond dipped to 1.57 percent Monday, or 10 basis points lower than the rate on the three-month Treasury bill, compared with a gap of 6 basis points Friday. That inversion hasn’t happened since 2007, at the start of the financial crisis sparked by a U.S. housing crash. The 10-year inflation-linked bond, meanwhile, offers a negative yield in real terms, after accounting for consumer prices. Yields on government bonds have fallen in recent weeks amid weakening economic data in Canada, including lower than expected growth in the last quarter of 2018. The Federal Reserve Wednesday tilted even more dovish and the German bond yield returned to zero Friday as Europe’s largest economy weakens. Investors are buying top-rated government securities in Canada as retail sales unexpectedly declined in January, reinforcing concerns that consumers may no longer be able to drive the economy with household debt at record levels and borrowers facing higher costs following five rate hikes by the Bank of Canada. Economists forecast growth of 1.5 percent this year, down from 1.8 percent in 2018, according to Bloomberg surveys. “The yield curve is the best economist out there” and shouldn’t be ignored, said Benjamin Tal, deputy chief economist at Canadian Imperial Bank of Commerce, in an interview Monday with BNN Bloomberg. The yield on the government of Canada 10-year inflation-indexed bond has turned negative, Gibbs points out in his note. 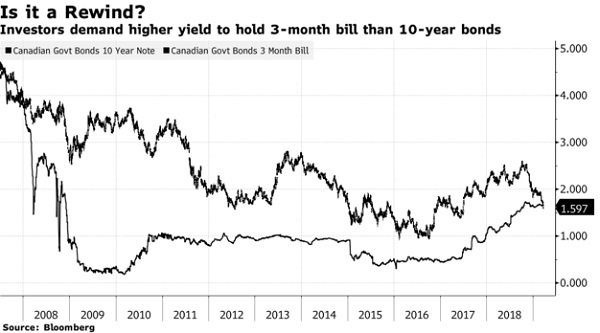 Canadian bond investors have been rewarded by the plunging yields, with an aggregate index of Canadian debt returning 4.1 percent this year, compared with a 2.6 percent gain for a comparable U.S. gauge, according to Bloomberg Barclays indexes. Investors appear to be betting on a pause by the Bank of Canada for now. Toronto-Dominion earlier this month shifted its view and now expects the overnight rate to remain at 1.75 percent through the end of 2020. That would mean Poloz has already made the last rate hike of his tenure, which ends in June 2020. If there is any move this year, it’s more likely to be a cut, based on trading in the swaps market. Chances of a rate cut at the Bank of Canada meeting in September have risen to about 36 percent, from 23 percent a week ago, according to swaps rates. Traders assign close to a zero percent chance of a hike by then. There is a 29 percent chance of a rate cut at the July meeting.